Repent and pay your penance with hours of weeding for planting, once again, a plant that you had no business planting, that took hold in your garden and while you weren’t looking, spread and smothered and self-sowed and destroyed all that was in its path. Repent for all the plants around that thug, that monster, that invasive hog-plant that seems to know no bounds. Oh, yes, proclaim your innocence! You are the victim here, standing there holding that four inch pot with the cute little plant. They are selling it, it can’t be bad! Another gardener is offering it to you for free! Would they do that if it was an invasive? After all it is just one tiny little plant in a four inch pot. You are Super Gardener. In your garden, you will control it, tame it, make it grow only where you would have it grow. You will show it that YOU are in charge of it. You should have listened to that little voice that said "Don't plant it". But you didn't. Now you must pay for your transgression! 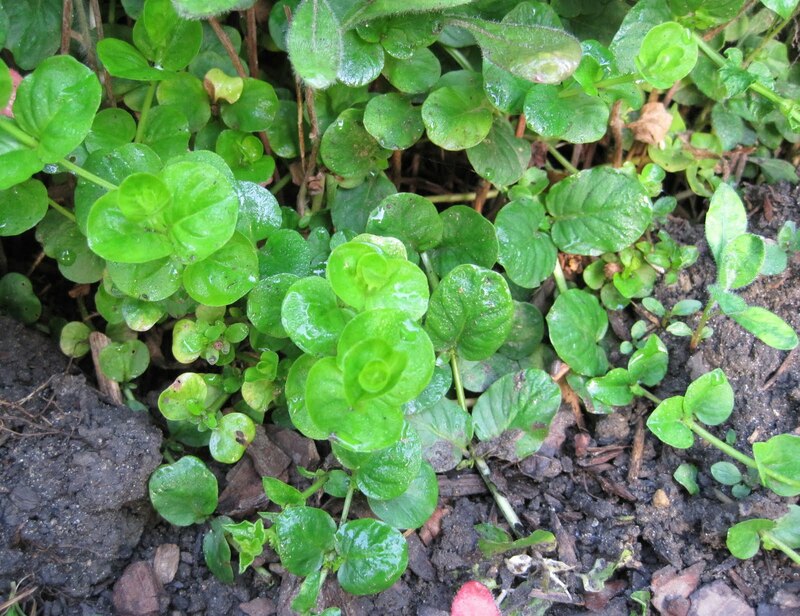 I am sorry that I planted that moneywort, Lysimachia nummularia, in my perennial bed. I was a numskull for doing that. 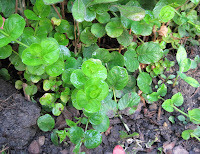 I now know that the love of planting of moneywort is the root of all evil. Please forgive me. I will work to get rid of it. I promise. Please do not let it grow anymore. Um... Amen?! Too funny. And yes, I have some repenting to do, now I will be giggling as I weed, thanks for the fun. My evening primrose was a gift from a friend(?) - a little trowel full. I've been digging, pulling and cursing for years. I continue to repent! Surely you're not talking about my lamiums? Or my Lamiums? Lysimachia nummularia aurea does look pretty trailing out of a pot, but I've been too afraid to even try that. No need for repentance in my garden, Carol - Lysimachia nummularia aurea has survived only as a pampered pet in containers - it died when planted in the hot ground. I've seen it look wonderful when growing along artificial streams in some gardens on the annual Austin Pond Tour. Thanks for the sermon = I feel better now about ripping out the violets that were taking over my garden. Apparently they had "wandered in" from a neighbour's yard. Amen! I say this on my knees, repenting of EVER planting what will forever more be known as "Accursed Mistflower." I had the misfortune of buying a home whose previous owner planted nothing BUT plants that spread like crazy. After 3 years of trying to rid the place of Aegopodium, Lamium, English Ivy, and numerous Unknowns, I'm starting to think the unthinkable--Round-Up. Oh boy, do you ever have that Lysimachia right on. I planted it in between the pavers of one of my paths in the stroll garden, and I am continually assailed by the thought "What was I thinking!?" I repent, most heartily repent! Previous owners of my home must do the repenting, but I'm the one stuck with the weeding, weeding, weeding of this cute little invasive. I can't be too hard on the sinners, however, since they left me with a wealth of peonies of many kinds. A spell of hot, dry weather usually sets the Lyismachia back, but with the wet spring we've had, it is taking over everything.